During BlogHer13, I was able to connect with some brands. I am sharing my experiences and information that I learned about one of these products. Peapod. With school about to start, I would like to think that my scheduled gets lighter. From long, lounging lunches to lazy afternoons on the couch, I will have all the free time that I could dream about. Now it is time to wake up from my fantasy. Yes, the kids will be in school for several hours, but free time is a luxury that I will never experience. The chaotic family schedule can be helped with Peapod. 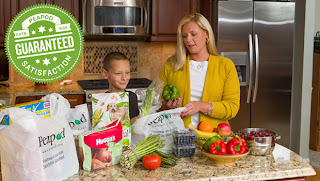 Peapod allows families to grocery shop anytime and from anywhere. Whether I'm stuck at football practice or waiting at doctor appointments, I can complete my grocery shopping at the touch of a screen. Peapod has a large assortment of items that can stock any family's refrigerator. The company offers organic, meats, produce and even prepared meals. If you have purchased it at a brick and mortar grocery store, you can find it at Peapod. If you are a coupon shopper, you can redeem your coupons at Peapod. Manufacture coupons are doubled up to $.99. It can make for big savings when coupled with sales. No more excuses for not trying Peapod. Simplify your grocery shopping today with the push of the button. You will smile when the green truck arrives at your door. Disclosure: I may receive a free trial from Peapod in exchange for this post. Sounds like a great service! This would be perfect for those first few weeks after bringing home a newborn! I tried this service once and it was great. I love that you can use coupons and get their specials, after all, I am in this to save money! I did not drop by this booth because I'm Canadian they don't deliver here :) but thanks for the post. I think it is a wonderful idea. I especially like that they double up on coupons. YES!! !